Dendrochronology is a - to the year - exact method of dating wood. Tree growth only occurs in the outer layer between the bark and the actual trunk. In temperated zones of the world, trees only grow during the warm period of the year. During the summer the growth is relatively fast resulting in a light wood. In the autumn the growth is slower and gives a dark wood. If the summer weather is warm with a lot of rain we get a wide ring of new wood that year. If the weather is cold or there is no rain for a long period the ring width of that year will be very narrow. This creates a pattern of individual tree rings of varying width depending on the current local climate, i.e. depending on the variations in precipitation and temperature, and sun light. The weather variation over a number of years gives a ring width growth pattern which is characteristic for those years. We could say that it looks like an individual fingerprint of that period. By measuring tree growth over a long period, a local reference curve for a certain tree species can be constructed showing mean values of the differences in annual growth. The curve is constructed from tree samples of varying age where the period of growth for any sample overlaps the periods of growth for some other samples. According to Schweingruber, F.H., 1983: Der Jahrring. Haupt, Bern und Stuttgart, 234 S.
Note that this picture only shows the pinciple for building a reference curve. Firstly, the overlaps shown are far too short to give reliable results. Secondly, the ring width curves are very seldom so alike that a visual inspection is sufficient to find the true matching point. Also the growth of different trees varies with e.g. the soil quality. Therefore, "in real life", mathematical methods are employed to synchronize the samples. If the reference curve is terminated with samples from living trees, or trees where the felling year is known, each growth year in the curve can be assigned a true calendar year. Usage. A local reference curve can be used to compare with samples of unknown age, thus dating the samples. If an old sample has its outer ring (directly under the bark) intact, it is possible to determine when the tree died. This is interesting when dating buildings, archaeological structures and geological features. A long and strong reference curve often correlates with other reference curves from more distant regions. In that way reference curves can be verified against each other. Today, dendrochronology is used worldwide for identifying variations in local and global climate. The trees also can contain information about major downturns like volcanic eruptions, droughts or wild fires. Furthermore, dendrochronology has been used to establish calibration curves for other dating methods, such as radiocarbon dating. 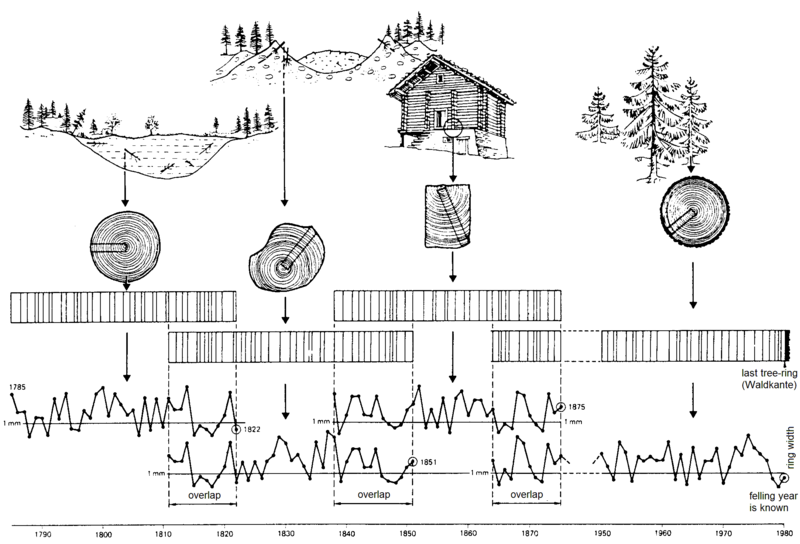 A short description of dendrochronology in German is available here. Historical knowledge about our neighbourhood is a quality in our lives. Understanding why things are as they are. Dendrochronological dating methods can be a tool for amateur historians who want to understand local history. Usually old houses in bad condition are at best photographed before they are demolished. Commercial dendrochronological dating is normally out of question because it costs too much money and it does not give any new outstanding knowledge. Though it may be a piece when understanding what actually happened. These pages were originally meant to be a starting kit for historical amateurs who want to use this dating method on timbered houses and other wood constructions in their neighbourhood. CDendro&CooRecorder has been sold as a product since March 2005. Before that the program package was available for free for a number of years. Though my first coding to solve dendrochronological crossdating problems started in 1995. Today, in 2015, the inexpensive CDendro & CooRecorder program package is sold all over the world, mainly to professional dendrochronologists and dendro students but also to other people being interested in this technology. If you start using dendrochronology to date old buildings, see that you publish your data and your documentation. Without your data available, nobody else can check and certify your results. Without a chance to check you work, your claims on dating can never be more than what you say. Some stories told on this site will support that statement even more. If you want to learn more about dendrochronology as a method, or if you want to try yourself, look here.